This accessible kitchen article is part of a series of articles about the the Universal Design Living Laboratory, the home of Rosemarie Rossetti and Mark Leder. That start of that series can be seen here. An accessible kitchen helps people with physical limitations to be independent and it reduces the daily frustrations, since people are likely to handle kitchen tasks several times a day. The kitchen in the Leder-Rossetti home is very visible and public. The living room, kitchen and dining room are all in the same open space. This is ideal for the teaching aspect of the Universal Design Living Laboratory. Visitors can see firsthand the accessibility features of their kitchen. I have briefly discussed how the stove is designed to allow Rosemarie and her wheelchair to roll right up to the cooking surface. What I did not mention at that time is the other features of that stove. 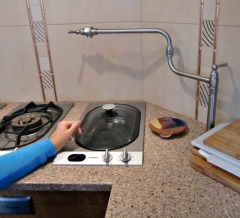 This stove is plumbed and has its own water source and drain. 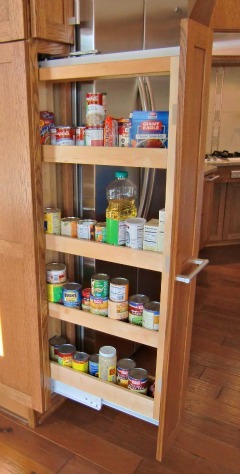 This is a feature found in some high end kitchens and is a great convenience. A spigot on a swivel can pour water directly into a special special steamer. The water that flows into the steamer can also be drained directly from the cooker without removing anything from the stove. The gas burners on the cooktop and steamer are all made by Gaggenau. They each have their controls at the front of the burner, within easy reach for Rosemarie. The steamer won a Good Design award from the Chicago Athenaeum Museum for Architecture and Design. That is a pretty special award but not uncommon for Gaggenau. Gaggenau cooktops and ovens have won many design awards over the years. Since the oven is not under the stove it has been built into the center island. Next to the main oven is a built in microwave. Both double as convection ovens. Both are set at a height appropriate for Rosemarie in her wheelchair. This puts the counter above the ovens higher than appropriate for Rosemarie, but perfect for 6 foot 4 inch Mark. 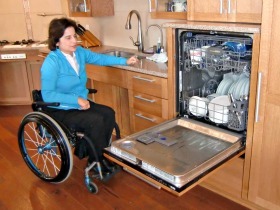 This gives him a kitchen work area that is ergodynamically comfortable while serving her needs for an accessible oven. The unique aspect of the oven is a side-opening door. Rosemarie had a difficult finding such an oven until their search brought them to Gaggenau. The side-opening door allows her to roll up right to the cooking racks instead of having to lean over an open drop door found on most ovens. The Thermador microwave also opens to the side, which is normal, but she did make sure that it opens the opposite direction of the Gaggenau oven so that she can cook at both ovens at the same time. All the handles are big and wide, and the hardware is designed for easy opening. The drawers are also all self-closing. This is not an uncommon option for kitchen hardware, but it is an accessible feature that makes life easier when you are cooking from a wheelchair. The cabinets were all designed and manufactured by KraftMaid. They have some very convenient features. The knife drawer is two-tiered. A sliding tray within the drawer provides easy access to a large number of utensils without having to fish around at the bottom of the drawer. Spice racks are open from either side, so the spices are visible and available no matter which side of the rack you are working. Rosemarie does not have to dig out pots and pans from underneath the counter. The cabinets are all pull out drawers, so the pots and pans come out to her. This requires a little discipline so that your pots and pans aren’t stacked so thick that they are spilling out over the edges of the drawer, but it makes digging out your pans a lot more pleasurable than when you have to get down on your knees and look into the dark to find the pan that you need. 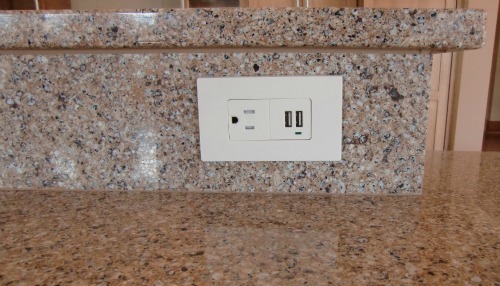 There are plenty of outlets available at the counter level and a conveniently positioned appliance garage. Above the counter recessed strips of LED lights keep the counter well lit. At the time I visited Mark was working on installing similar LED strips above the upper cabinets so that the lights could provide a gentle background light even when the kitchen was not in use. That feature is more for the aesthetic effect than for any direct lighting advantage. At the base of the cabinets the toe kick is nine inches high by six inches deep to accommodate the wheelchair footrests. This is higher than the toe kick found on the bottom of standard kitchen cabinets. The countertop is a natural quartz called Silestone made by Cosentino. The Silestone is non-porous and has an antimicrobial component so it cleans up a little more antiseptic than your standard granite. It also is stain-resistant and in general just a little easier to maintain than granite, but with the same beautiful, durable look. The island also serves as a serving area. 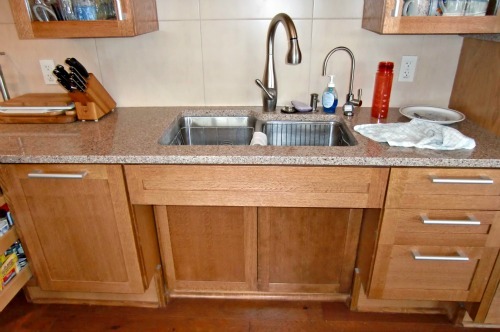 The countertops extend out at one end for an eating area conveniently close to the food preparation. However, when a more formal setting is desired the dining room is only a few feet away. There is a direct path between kitchen and dining so that neither serving nor cleanup requires negotiating any obstacles. The sink counter has a cutout for easy access, but the sink is so deep that Rosemarie can’t get in quite as close as she can with the stove. The sink has a tall, gooseneck faucet. With the deep sink and the tall faucet cleaning large pots does not require having the pots sideways or at an angle. As in most households cleanup is aided by a dishwasher. The dishwasher itself is not a special model. It was a standard off-the-shelf model. The accessibility part comes in how it is mounted. It has been raised up several inches, putting the plates where they can be easily reached, without putting the top rack so high that the glasses are inconveniently placed. The final aspect of cleaning the kitchen, cleaning up the floor, will be dealt with on a page dedicated to the built-in vacuum system. 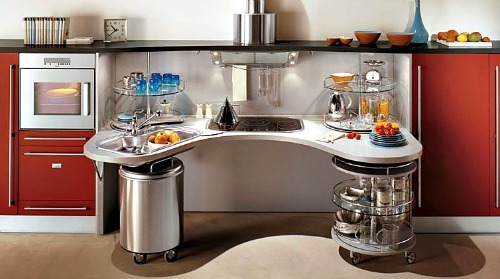 After writing the above article I came across this wonderful modular kitchen designed by an Italian company, Snaidero. You can visit their site to see additional pics. A little small, but very nice. 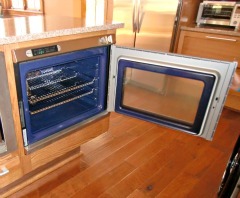 I have also added a list of appliance makers who supply side opening ovens to the U.S. market.